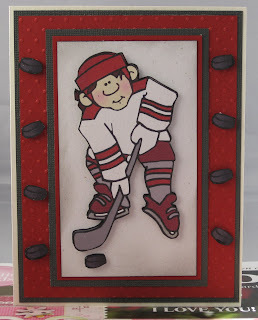 What kind of card do you make for a young hockey loving 4 year old, a hockey card of course. I had the nicest little jersey embellishment I was going to use but it just did not seem a fun for someone so young. Thank you to mydreamfufilled for the free hockey image. Take a look at this site, there is a ton of free digital items. I cropped the image to get all those little pucks, they are cut out and popped up with Scotch foam tape. The hockey player is also two dimentional. There is some gray shading around the image as well. I used Microsoft Word to print of a Happy Birthday for the inside. Supplies: Cream, red and gray cardstock, Digital image - http://mydreamfulfilled.blogspot.com/, Cuttlebug – Swiss dots, Gelly Roll – glitter pen. I made this card for Gung Hay Fat Choy. I played with my small inks on the stamp to see if I could make a multicolored image. I would have gotten a better image if the cardstock I stamped on did not have small ridges. I love these oriental designer papers I picked up at the local stamp store before Christmas. I secure the coin with a little bit of red mesh ribbon and a piece of gold cardstock as a small buckle. 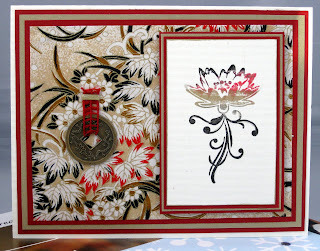 Supplies: Cream, red and gold cardstock, Designer paper – misc Oriental paper, Inkadinkado-Lotus Flower, misc-Chinese coin, mesh ribbon. I seem to be having techinical difficulties with my blog, images missing and such. Sooo as the saying goes KISS. Keep it Simple, so I am going to use a simple template for a while and see how it works out. I will dearly miss the wonderful blog designs my sister Barb made for me and I may encourage her to make me something new in the future :). Will try to get things back on track soon, content is the important stuff.... isn't it. Again with the creativity block, things on my mind I guess. I usually only make two Valentines cards, the first of course for the my sweet and wonderful husband, the second for my bestest son ever. I had a bit of a late start, well I guess not really one was done 3 weeks ago the other last week but it felt like crunch time in my mind at the time. Is that a song, it sounds like it would be a good song “Crunch time in my mind”. Anyhoooo, once this card started to come together I was excited, mostly because I was stumped on it for a while. I started with my multitude of layers, of the hardest parts to this card was the hearts, there are two more inside. They were created with Nestabilites Decorative photo corners, you have to run the die cut through the Cuttlebug once to cut, they a second time to get the wonderful embossed design and you need to shuffle the sandwich stack in between. You can really see but the hearts have a double layer, the bottom layer is silver the top black faux suede designer paper. 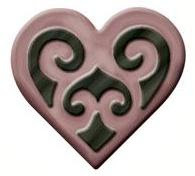 This is the Spellbinder Shapabilities I used for the heart, I wish the design was visable in the card portrait.The Black tie designer paper is really a wedding series but serious, unless I tell my husband he will never know. 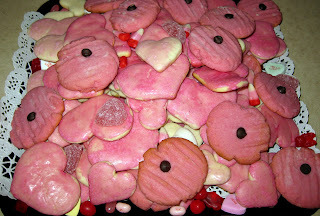 My husband only ever asks for cookies for Valentine's, sour cream sugar cookies to be exact a soft cookie. Those are the ones shaped as hearts. I though I would snap a picture of his huge tray of cookies. I mixed it up a bit with a second recipe of what Betty Crocker calls the Ultimate Valentines day cookie. 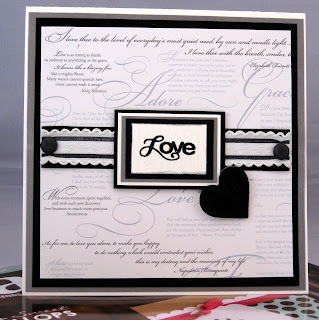 Card Supplies: Cream and silver cardstock, faux suede and making memories Black tie designer paper, Inkadinkado – Love, Making Black tie – ribbon, Doodlebug sugar coated Black brads, Nestabilites – Decorative Photo Corners – Heart. A simple sweet little Valentine’s Day Card, this one is for my son. Valentines card are one the designs I always struggle with, maybe that is why I only ever make two. Happy Valentine's Day to one and all tomorrow. 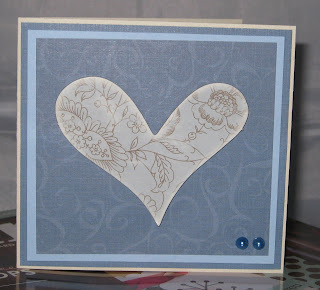 Supplies: Supplies: Cream and blue cardstock, Designer paper – Scrapbook Walls Denim Swirl, misc heart embellishment, Recollections – blue pearls. This is not a very good picture at all, the card looks so much better. 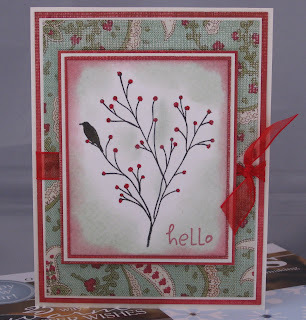 I wanted to try Patterned embossing that Gina K did an instructional video on StampTV. This site has so many great ideas. I think I left the center a little too light, I darkened it slightly after I took these picture. Although it really is not this light when looking at the card. A little closer look, you can see the scrip that was stamped under the clear embossing. I have spent only a handful of minutes at an given time in my craft room over the last week or so. I am feeling the need to huddle away for a while though. 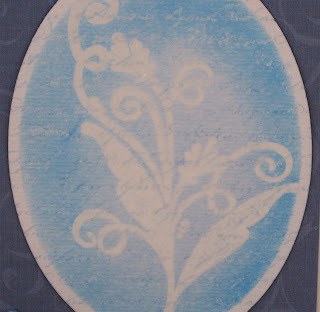 Supplies: Cream and blue cardstock, Designer paper – Scrapbook Walls Denim Swirl, Heidi grace designs, Stampabilites – Faded Text Background, Dress me up blue heart button, misc blue gems, misc blue ribbon. Happy Anniversary Barb and Miles :). I know you will have a wonderful day, Enjoy. 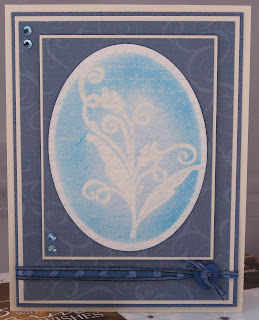 I think I had the most fun stamping the flowers for this card. I first I coated the flowers with Versamark Dazzle – Frost, this made them sparkle. 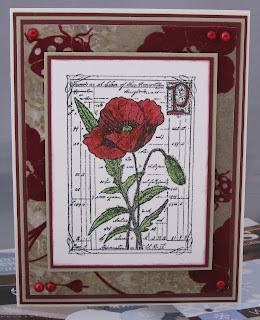 Once that was dry I stamped them with the Stampabilites – Faded Test Background stamp in a purple. I finished the inside with Happy Anniversary. 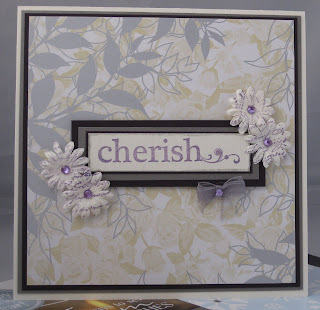 Supplies: Cream, silver and plum cardstock, Designer paper – Making Memories – Black tie, Hampton Art – Cherish, Stampabilites – faded Text Background, Close to My heart – Just Blooms, Kaiser – Gems, misc ribbon, Versamark Dazzle – Frost. Just another quick card. I am not sure why I liked this stamp, we have this huge Murder of crows in our area. They freak me out, there has to be 50 of them. My husband teases me by saying that when they caw they are actually saying 'eyes eyes' which sounds about right if you have ever been dive bombed by one of these black meanies. A murder of crows sounds abtly named to me. My sister will say it is all payback for my mean talk on hunting her quails. Anyway, enough of my bird oddities. I had some of this double-sided designer paper left over from my visit with my sister this summer so I wanted to use that. It worked well with this stamped image. I used some moss and red ink when sponging around the outside of the image, I did not quite wait long enough for the light colour to dry before applying the darker colour and they ran together a bit. Learn by mistakes I guess. The bird had a fine later of glitter marker on it, the red sparkles are Stickles. The layers are popped up with my Scotch mounting tape. Supplies: Cream cardstock, misc dollar store Designer paper, Penny Black - Nature's Dance, Inkadinkado - Hello, misc red ribbon, red Stickles. I am trying to be frugal with my craft spending for a few months, so I limited myself to a single stamp last visit to the local stamp store. I was drawn to this cling mount stamp from Magenta. I could picture this simple card in my head when I saw it. This designer paper may not be the best combination for this stamp but it was the one that I seemed to be calling to me at the time. All the large print flowers, vines and bugs are fuzzy. I coloured the poppy with my Sprica glittter markers so they glisten nicely. Supplies: Cream, tan and burgundy cardstock, Designer Paper - Creative Imaginations - Christine Adolph, Magenta - Crafy Indiviguals - Poppy, Recollections - Red pearls, Spica markers - Lipstick and Melon.